What is the first brand you think of when people say 70-200mm? Nikon? Canon? What about Tamron? Pentax? Olympus? or even Sigma? Most people regard the first 2 as being the best lens maker on the market. No doubt this is due to the quality of their product but such thing comes at an incredibly high price. Unless you have the pockets of money that can rival most Silicon valley tycoons, you’ll most likely will be looking at what are called the “third party” lens makers. Namely Sigma and Tamron. I honestly tell you now, if you have the cash, go for the high end stuff. 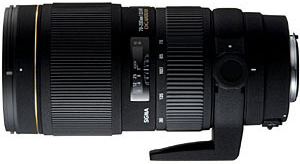 If you don’t then the 3rd party lens like this 70-200mm from sigma is also a good bargain, it has almost all the features as well as built of the Nikkor 70-200mm f2.8 VR. The only drawback of this lens is the lack of VR/IS which is worth its weight in gold! The only advantage this lens has over the Nikkor or canon version aside from the price is the macro range(no, you cannot do life size 1:1 macro). This feature instead allows you to focus on subject closer then the Nikkor or Canon could. But again, the main point of buying this lens over the Nikkor or Canon version is the price and the macro range is very under use here as this lens is meant for long range. So if you really want a good 70-200mm and can do well without the VR/IS feature (such as using it mostly on a tripod/monopod) then by all means, this is a good lens. Some would argue that the colors from this lens always seems to give an orange cast to photos taken with it. So far I have not seen anything to this case, if someone would like to correct me then by all means drop me an email with proof and I’ll gladly amend my review. Also for people who are first time using this lens or any lens with this time of specs, I offer you some tips to help you get use to this type of lens . If there is definitely enough light in the photo, don’t bother shooting at wide apertures(close it down to f4 or f5.6) and instead shoot at shutter speed 1/400 as these type of lens are heavy and a fast shutter speed should help you get a good sharp photo but if you have it on a tripod or monopod, in which case, go wild on the settings then! If the scene is not so brightly lit, then in that case, open the aperture all the way! If its still not enough, then put on a flash unit) especially at night, although be warned adding on the flash it seriously going to make the whole camera damn heavy! If you find that its heavy to carry around always, use the included lens holder bag as a holster of sort for both your camera and lens along with the hood. Now note that Sigma lens are all covered in weird coating which seems to help reduce heat from sunlight, as well as provide a better grip. This coating comes off with time so don’t be alarm if you notice that it starts to peel off. On a lighter note, if you are planning to buy a second hand version, you can use the fact of how much the coating as peeled off to judge how old as well determine its overall condition to help make a decision on buying it. Though lens should not be judge on such metric entirely, if you don’t give a rats about grip (like me as I wear training gloves to hold my camera), then judge by how good are the optics instead. I won’t be including any photos here for this gear review as I’ve taken a lot of pics using this lens so you can check out my gallery to see some example! Anyway pleasant dreams!